Japanese scientist and devout Buddhist, Tsuneo Iwasaki’s 岩崎常夫 (1917-2002) genius was to deftly interlace his uency with Buddhism, science, and imagery to encode paintings with metaphysical content by shaping microscopic and cosmic forms with the Chinese characters of the Heart Sutra, a treasured Buddhist text known for its profound wisdom and healing powers. Iwasaki’s scienti c and Buddhist insights are integrated in a compassionate ethics of interdependence that aims to relieve suffering and offer healing wisdom. Please join us for the exclusive West Coast exhibit of Tsuneo Iwasaki’s work curated by Dr. Paula Arai. 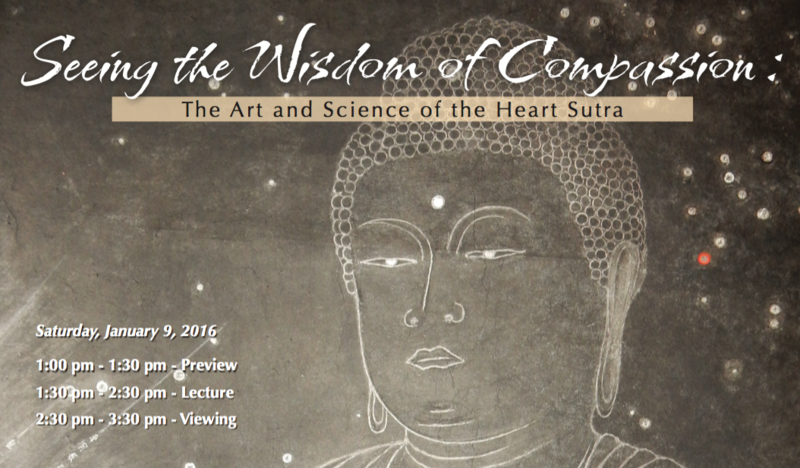 Dr. Paula Arai is a renowned author, speaker and professor of Buddhist Studies, who worked closely with Iwasaki while researching his paintings which illustrates the liberative power of the Heart Sutra.